Dag-Nabit Jeb, We had to high-tail out of that last town so quick, I plum fergot to grab holt of that-thar Frenchy Press we was toten! I tried to tell ya Wes! Ya should a picked up that dandified little campfire Spresso maker at the dry-goods store back in Turley. The first real cowboys appeared in the middle 1800's during the days of the great cattle drives. Their task was to herd wild Mexican "beeves" up to graze on the open ranges of the American West. A cowboy's supper usually included beans, sourdough biscuits, oh yeh, and uh... beef, and (who knew?) strong black kettle-brewed coffee. Now rustle up yer crew and decide how many cups of coffee you wanna brew. Fill your kettle or brew pot with COLD water to match. Pour about one heapin tablespoon of coarse ground coffee (for every two cups) directly into the water. Bring that water up to a rolling boil. Remove from the heat pronto. Now..some folks like to add the coffee while the water's cold and halt the brewin at the boil. Some have found it's better to add the coffee at the boil and then bring it back up to a rollin boil before takin it off to settle. I'm not tryin to mix ya up but try it both ways and see for yerself! * You can splash a little cold water (just a splash) into the top of the brew pot and then give your brew about five minutes to let the grounds settle out. * Although I aint tried it yet, it's said that tossin a crushed eggshell into the pot will settle the grounds right to the bottom. It could be a tall tale but it gives you somethin interestin to do betwixt brewin and pourin! You'll still need to let it brew for a few minutes before servin. At this point you're ready to pour (or dip) yourself a genuine cup of the Old West. Enjoy your Cowboy Coffee but take warnin...It may buck a bit, cuz it shore aint saddle broke! Yippee-Yi-Yo-Kayee Cowpokes...That-thar is Cowboy Coffee! Obvious, but overlooked, it's just perfect for camping. You don't need anything but coffee, but it's best coarse ground. You'll avoid over extraction that causes bitterness and the grounds will settle out better. Even better, it's perfect for backpacking. If there is anyway to lighten your pack, it's gotta be by carrying... nothing. 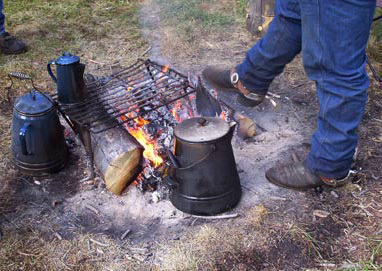 All you need is a pan you'd be hauling anyway, and your World's Best Coffee! We think you will find this is a perfect fix if your going to a non coffee drinking friends house for a day or two. Again, all you need is coffee. It brews an excellent cup of coffee, just like a French Press. As always, the quality of coffee you're using is all important. No method of brewing will produce great coffee if your coffee is... NOT. For a barn-burnin good tutorial on Cowboy Style Coffee, with plenty of tips and techniques, click on the I Need Coffee icon below! Thanks for droppin in and visitin our Cowboy Coffee Page! 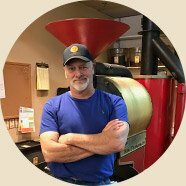 Check out Lakota Coffee Company's World's Best Coffee Selections!